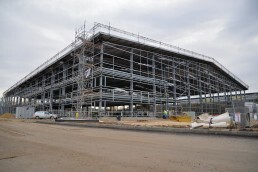 Located on Ashroyd Business Park in Barnsley – just 5 minutes from the M1, we were contracted on to design, fabricate and erect the 83m span frame. This new premises created 150,000 ft₂ of warehouse and 15,000 ft₂ of office space for Universal Components UK – one of the leading UK suppliers of truck and trailer parts. Works on site started during the winter months of 2015, finishing in the early part of 2016.